Slotland’s games developers have been very busy improving the graphics and sound effects of the site’s most popular online slot machines and video poker games, but they’ve also found time to come up with an entirely new game. The new Lucky Ducts, a 5-reel, 19-payline slot machine with multipliers and free spins, has just launched. The new game looks and sounds great in regular format but in the new Flash format it is amazing. Lucky Ducts’ swimming pool theme brings relief from summer heat as rubber duckies, beach balls and toy fish spin on the watery wheels of this one-of-a-kind game. 3 Water Faucet symbols at a time raise the Bonus Reservoir one level and increase the win multiplier to x2, x5, x10, x25 and finally x50. Players get 6 free spins when the Bonus Reservoir reaches the top level and overflows. Like all slots games at Slotland.com, Lucky Ducts is tied to the site’s famous progressive jackpot. Five Diamond symbols on one payline, with a bet of $20, wins the jackpot which is currently over $110,000. Hit quite regularly every six to eight weeks, the average Slotland jackpot win is about $150,000. The new Lucky Ducts is one of six games at Slotland.com that is available in the new Flash format with enhanced sound effects and graphics. Slotland’s new Flash games also feature improved navigation to other games and site features, and brief video tutorials to get new players started. The 5 games that have been re-launched so far are the Golden 8, Reel Riot and Treasure Box slot machines and video poker games Wild Heart and Jacks or Better. There’s still time for Slotland players to enter a special summer photo contest for a chance to win a $250 or $100 bonus. To enter, players are invited to submit, by 31st July, photos of their favourite place to play Slotland games. Entries will be posted at www.flickr.com/photos/slotland. Slotland.com now has 16 original slot machines and video poker games not available at any other online casino site. Four of the most popular games are also available on mobile phones and PDAs. All of Slotland’s slot machines give players the option of placing a maximum bet for a chance at the progressive jackpot. 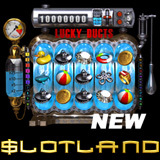 Slotland’s games are all instant play casino games so there’s nothing to download or install. free.